Streamsong exudes romance and is perfect for honeymooners or honeymooners at heart! 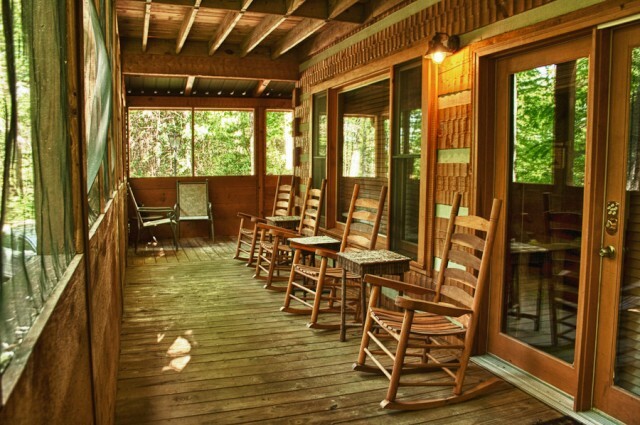 This secluded, two bedroom and two bathroom Wears Valley cabin was custom built with love birds in mind who desire a relaxing escape to the Smoky Mountains. Great Cabins in the Smokies is excited to introduce you to this exceptional romantic cabin! On the main level of this cozy cabin, you will enjoy the large, open kitchen, dining and living areas as well as the spacious master bedroom with private master bathroom, including large Jacuzzi tub. Most importantly, you will find deck access on this level which allows you to enjoy the bubbling creek from either the screened in section of the porch or you can soak it all in from the open custom built walkway with additional seating area overlooking the creek. Take a stroll into the woods from this private walkway and allow the soothing sounds of the stream below to wash away the worries of your day-to-day schedules! This peaceful setting is exactly what you need to spark a little romance for you and your sweetheart, so you can truly escape to the mountains together! The upper level features a beautiful hand carved pool table that is great for some friendly competition. You will also enjoy additional deck seating from either the bedroom or loft game area. This is where you will find the second bedroom and bathroom, which offers space for you to bring along a few friends or family. Whether you reserve Streamsong for a romantic getaway for two or a peaceful retreat for up to four people, you will find yourself going home much more relaxed and with memories you will talk about and reminisce on fondly for years to come. Reserve this romantic cabin today, or browse our website to find another one of our Wears Valley cabin rentals that meets your needs. Come on out and escape to the Smokies this fall! Great Cabins welcomes you!